Did you hear that there's a plan to begin to remove from the air in our city carcinogenic diesel smokestack emissions produced by ships - both container and cruise - that are currently idling while visiting our ports? Did you hear that the Brooklyn Cruise Terminal in Red Hook is going to take the first step of this plan, with the visiting cruise ships "plugging in" to the City's power grid while in port, thus allowing them to, in a practice called "cold ironing", turn off their idling diesel engines - engines that produce the equivalent emissions of 12,000 cars per day / per ship visit? Did you hear that the Port Authority has committed, financially and otherwise, to building the "shore power" infrastructure required to make this practice possible and has received an EPA Diesel Reduction grant to assist? Did you hear that Chris Ward, Executive Director of the Port Authority, said that plugging the ships in would save the residents of Brooklyn an estimated $9 Million per year in "monetized health costs" - you know, in cancer, premature death, asthma, heart disease, etc? 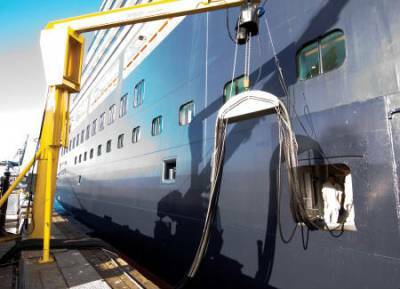 Did you hear that the cruise ship operators, Carnival, have committed to retrofitting their ships to accept "shore power"? Did you also hear that the power supplier - Con Edison or the NY Power Authority (which one of these entities supplies power to the Port Authority is still unclear to me) - doesn't want to supply a power rate that would make this practice viable, and that the Public Service Commission, which can set rates from utilities, after undergoing a baffling and ponderous process, hasn't yet made a ruling that would require this rate to be established? But, don't worry, did you hear that the NYC Economic Development Corporation, which brought the $56 million cruise terminal (and the unmitigated pollution from the ships) to the Brooklyn waterfront in 2006, has offered to subsidize the power rate so that the cruise ships can "plug in", without economic disincentive? Well, if your answer is yes to all of these questions, you've been paying close attention (perhaps to this blog). Most of this is pretty old news, actually, though I'll forgive you if you've missed anything. There's been little written about it in local press - in Brooklyn or in the city's major newspapers - which, I think, is part of the reason this is all taking so long. 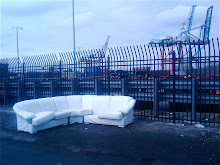 From January 2009 the Port Authority and NYCEDC has committed to the implementation of "cold ironing" at the Brooklyn Cruise Terminal. Along the way there have been various "hoops" through which to jump, but it seemed that everyone (who was required) was 'on board' with these plans. Politicians from Brad Lander, Joan Millman and others have presented testimony at Public Service Commission hearings endorsing and encouraging this plan. Chris Ward at the Port Authority, as I mentioned, produced those startling figures stating the importance of this plan in cleaning the air and reducing the health burden on our residents in testimony to the Public Service Commission. The EPA also produced statements outlining the importance of this plan - these statements are permanently listed on the right hand side-bar of this blog. But still - the ships are idling - Brooklyn is waiting. Still waiting ... despite the known facts about the harmful effects of these dangerous, but avoidable emissions. Despite the reality that establishing shore power at the Brooklyn Cruise Terminal would only be the first step towards instigating city-wide "cold ironing" throughout the Ports of New York and New Jersey, taking the equivalent of 7.8 million cars off the streets - to truly make NYC - Idle Free. But while Brooklyn and the rest of New York City dawdle, others are moving ahead. Tacoma, WA, has recently established a cold ironing berth for container ships (story here). This will take 1.9 million tons of asthma causing diesel particulates out of the air, as well as reducing Sulfur by 90%. In the Ports of Long Beach and L.A., where cold ironing has been practiced for a number of years, the "plugging in" of a large container ship is estimated to take the equivalent of 30,000 cars off the road. Shore power is also being used in other parts of the country and world - like Juneau, Alaska (the US's first cold ironing port), Seattle, San Diego, Vancouver, ports in Sweden, Belgium, Finland, and Germany and others. (see here). California has been on the vanguard when it comes to the broad implementation of these measures in the U.S., as you can see by the number of Californian ports on that list. The defeat in the last election of Proposition 23, the Big-Oil backed attempt to undo the regulation of greenhouse gas emissions in that state (see my post), is a win for all those hoping to clean the air in California and the rest of the country. It was thought that the adoption of Prop. 23 would have had flow-on effects to things such as the implementation of cold ironing in California and around the country, so its defeat was good news for all clean port advocates. With such barriers out of the way (fingers crossed and Republican controlled House willing), and more and more awareness of the benefits of such practices, I'm sure there's going to be more action on the cold ironing front in the U.S., with proposals in busy cruise locations such as Florida already underway. There's also been international action on the reduction of port emissions (Carbon Positive story here), with a group of European ports offering "discounted fees to vessels that outperform a new environmental ship index (ESI) measuring SOx and NOx emissions performance, and quality of CO2 reporting." "Under the voluntary World Ports Climate Initiative (WPCI), the Dutch ports of Amsterdam, Moerdijk, Dordrecht and Rotterdam will apply a new Environmental Ship Index (ESI) to arriving vessels from January 1 next year. Antwerp, Hamburg and Bremen are expected to participate soon after. The WPCI involves 55 ports of the International Association of Ports and Harbours which are looking at reducing their greenhouse gas emissions." Again, this will be an incentive to instigate clean port practices, including cold ironing, all over Europe. So if the rest of the country and the rest of the world are moving ahead on all of these measures, what's up in New York? Isn't that what we're all about? If they can do it there, why can't we do it here? .... it's up to you, (boom) New (boom) York, (boom) Neeeewww Yo .... OK, I'll stop. But seriously, this is taking too long. At the Brooklyn Cruise Terminal (and remember, this is only the cruise ships in Brooklyn - not including container and other ships), each year we wait is an extra 100 tons of carcinogenic SOx in the air. Each year is an extra 100 tons of smog causing NOx. Each year is an extra 6 tons of asthma causing particulates - spewing out over a neighborhood that already has 40% childhood asthma rates. Each cruise ship visit is costing Brooklyn residents, by the Port Authority's estimate, $150,000 in "monetized health costs". And I haven't even talked about greenhouse gases. I dunno. You'll have to ask them. 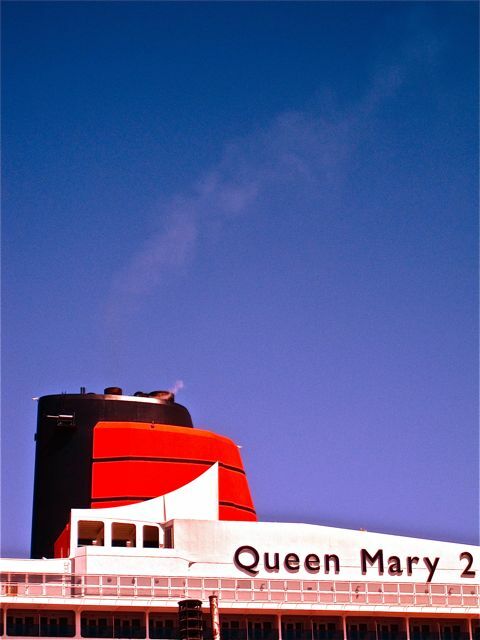 Pic from PortSide - Mary Whalen in the Atlantic Basin, Queen Mary 2 behind - idling. I love your blog. What a great story! You've got so much info in there. 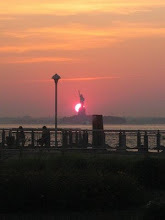 I just launched a web magazine covering South Brooklyn, including red hook, at southbrooklynpost.com. 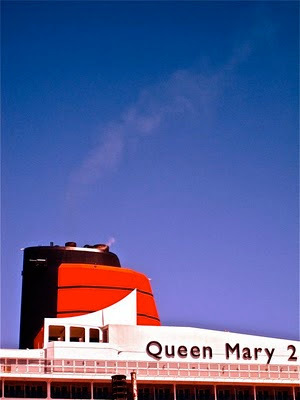 I'd like to do a story on this cruise ship issue, and profile you and your efforts to make something happen. Can you email me--maybe we could set up a time to talk? I'd love to interview you on this, on your blog, and then have our photographer take a portrait....lemme know if you are game!